On to hybrid weapons! Let's start with railguns. As the title of this post implies, railguns are the longest range turrets. In some cases, they even overtake all other non-turret weapons in order to claim the "top range". This is a very useful tool. However, railguns are more complicated than being plain "sniper" guns. Great range. Have I mentioned this already? Railguns have great range, and is a wide variety of optimal range bonusing ships that gives them even nicer range. Good damage. At the ranges where they excel at, railguns out-damage most (if not all) other weapon systems on equivalent ships. More on this later. Easy fitting. Unlike most other long range weapon systems, railguns in general tend to be light on fitting requirements. Of course, the largest ones in each class size may be difficult to fit, but its range usually enables trade-offs in other parts of your ship. "Gatling" alternatives. All sub-capital classes of railguns have one variety that has very high rate of fire, good tracking, and a relatively short range: 75mm, dual 150mm, and dual 250mm. Not only are they useful for some short range kiting, but they are also very easy to fit, making for good "placeholder" weapons for ships like the Vexor. 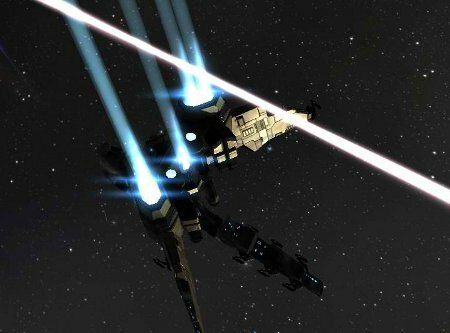 The Harpy is an amazing frigate-sized railgun platform. Limited damage types. Hybrid weapons only deal a combination of thermal and kinetic damage, with a lean towards kinetic when using longer range ammo. Usually these are "okay" damage types, but they don't really have the huge potential to wreck a heavy tank that EM or explosive dealing weapons have. 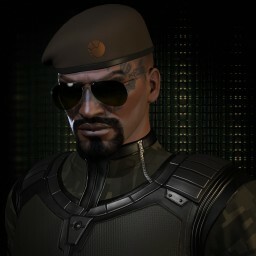 They also tend to be next to useless against T2 Gallente or Caldari hulls (which have very high Thm/Kin resists). Very poor at short to medium range. When used anywhere closer than their optimal range (particularly when using Antimatter ammo), railguns are plain inferior to other weapon types such as beam lasers and artillery. Unforgiving learning curve. Unless you're looking to only snipe from maximum possible range, expect a tough time learning how to pilot a railgun ship correctly. I hope this post will be of some help. Edit: Some capacitor vulnerability. While hybrid guns do not use as much capacitor as lasers do, they are still vulnerable to having your capacitor drained. Without power, they can't fire. Thanks to /u/Killerx09 for pointing this omission out. The Cormorant destroyer, hands down. It receives a double bonus to its railguns' range (50% base, plus 10% per Caldari Destroyer level), making it a great first ship to start taking advantage of being far away with. Try this fit to start with. If you have problems getting the 150mm railguns on there, it's okay to swap down to 125mm ones. To fly it, you simply have to try to stay at whatever your optimal range is (10 to 18 km, depending on skills), and fire your guns. Orbiting is unnecessary (and might even be counter-productive) unless your target is a cruiser or larger. The web is there for "pushing off" frigates that get too close and become hard to track -- not for purposefully getting within 10 km to use it. Needless to say, because the Cormorant is a bit slow, this fit works best when put as "fire support" into a gang. Using the Cormorant solo is... difficult, to say the least. I used to have a working gimmick fit for it, but since it does not have 4 mid slots anymore, that fit is useless. I have some experimental ideas for it, but nothing concrete yet. I may report back if I find a mind-blowingly good fit. Okay, enough on the Cormorant. If you absolutely refuse to use it, you can find a shorter range, higher damage variant of it in the Catalyst. Though it is optimized for blasters, the Catalyst can still handle railguns fairly well. On the frigate front, the Merlin, Incursus, and Atron all can be fit with railgun kiting fits. 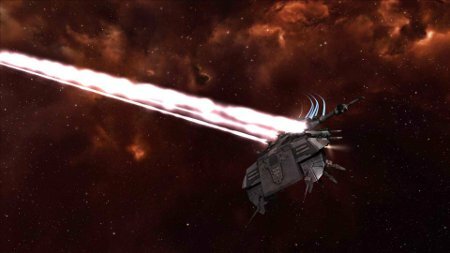 Railguns also find a home on the Tristan, where the tracking bonus makes them a decent auxiliary weapon (along drones) for ranged fits. If you would like more info on these sorts of shenanigans, get in touch with Fintarue, my corp expert on these matters. Everybody always says "Caldari are the missile race". Everybody is wrong. 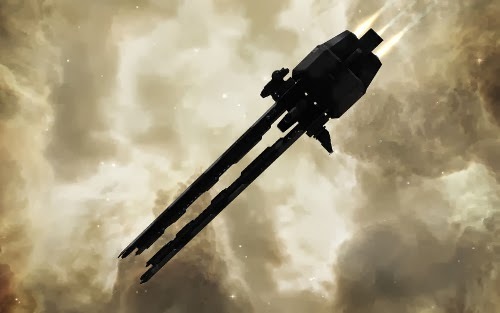 Along their lineup of missile ships, the Caldari also have a whole array of hybrid weapon equipped ships, all of which are excellent with rails. Some work with blasters, too. Here's a sampling, with some approximate range figures from common fits. 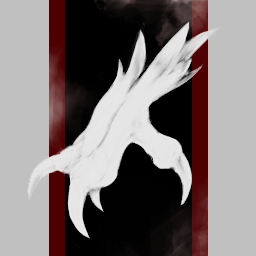 Harpy: one of the tankiest assault frigates, with great range and damage. It has some problems tracking (even when blaster-fit), but if flown smartly it can demolish a huge variety of stuff. Expect 20 km railgun range on a good fit. Moa: the Caldari take on "tanky brick with lots of damage". Works with both blasters and railguns, and has very good flexibility to trade between tank and utility, due to its large number of mid slots. Expect 15-25 km of range. Ferox: outdone at short range by the other battlecruisers, the Ferox instead beats all of them in ranged fights. It is very hard to kill, and projects damage to great ranges. Expect 30-40 km of range. Eagle: recently reworked to improve its combat performance, this heavy assault cruiser takes the Moa's tank and mobility, plus the Ferox's range... and improves on both of them. A great sniping ship. Don't get caught. Expect 50-60 km range. Naga: the longest range attack battlecruiser, specialized for doing very high battleship-sized railgun damage from long distances. Outdoes all the others at ranges above 70 km or so. Expect 70-90 km range (unless equipped with Spike ammo, in which case it fires farther away than ships are allowed to lock). Rokh: So far I have made a point to not mention battleships in this series, but the Rokh is the epitome of "giant brick railgun platform". Its range is the same as the Naga's, and the damage is a little lower, but it cannot be counter-sniped easily due to its massive hit points. Oh, and it's so badass it even has a song dedicated to it. On the Gallente line-up side, the ranges tend to be shorter, but the damage is usually higher. This leads to a lot of unconventional semi-kiting fits (like the frigates I mentioned). As this post doesn't go very far in depth on those tactics, I will leave those for another day. Antimatter Charge: General purpose high damage ammo. Fairly short range if your ship does not have a range bonus, though. Use the Federation Navy or Caldari Navy variants if you can. The extra damage is worth it. Uranium Charge: Higher range and lower damage than antimatter, uranium charges are for those situations in which you really need to squeeze a little more range out of your railguns. 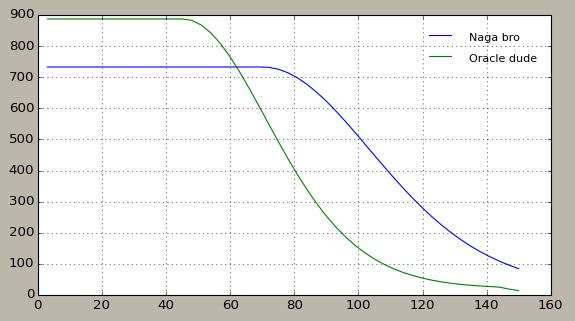 May actually end up doing better damage than antimatter due to superior tracking at longer ranges. Spike: Uranium doesn't give you enough range? Spike cranks the range up to maximum. It's another slight damage decrease, but the range is immense: 3.6x that of antimatter. Caution! Spike also reduces your tracking 75%. Never ever use it against fast moving things, or at short ranges. Javelin: Okay, your target caught you, and your antimatter is no longer tracking. Stick this ammo in and enjoy the tracking boost. It comes at the price of range, though, so remember to switch back to other ammo when you need to shoot stuff far away. 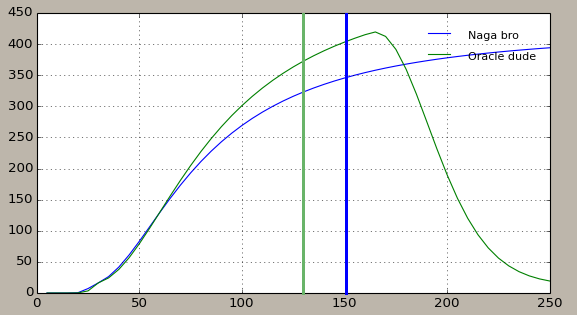 Many critics of railguns claim that railguns are not useful due to their having lower damage figures than those of beam lasers. However, railguns have something that beam lasers do not have: range. Ouch. Now, just for curiosity, what happens if we compare hyper-long range performance (Aurora vs Spike)? 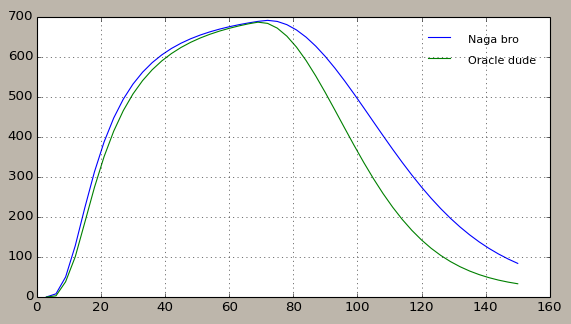 The extra vertical lines are the lock range limits with these two fits. 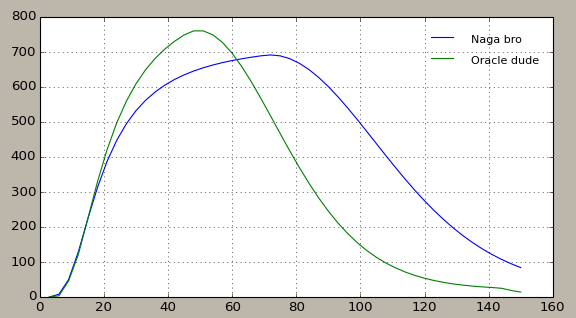 To get locking range matching the Naga's, the Oracle would have to give up either speed or gun range, while the Naga can be more easily refit as it won't suffer as much from replacing one of its Tracking Computers with a Sensor booster. Disclaimer: This entire theorycrafting session was manufactured inside my sick and twisted mind, and may be full of bad fits, opinionated statements, and overall wrongness. Feel free to be offended if you dislike it. I know I do. I'll leave it here. Good luck with your railguns, and tune in soon™ to learn about the last kind of turrets: blasters! I really hope you continue to post. This was an informative article. Keep it up!